Our StoryVillawood Properties has grown to become one of Australia’s leading residential land developers. NewsVillawood Properties is one of Australia’s leading property developers and an authority on residential land development and related topics. How do I buy?Building a home. It’s the biggest financial decision most people will make in their entire lives. THE weird and the wonderful turned out for Villawood Properties’ Armstrong Home Show on Saturday. 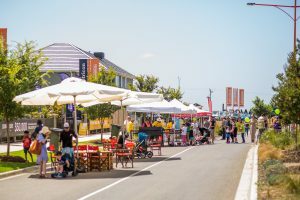 Children big and small danced, bounced, nibbled and gulped as mums and dads sorted their way through a swathe of one-day deals and offers from builders at Armstrong Mount Duneed’s 36-property display village along Unity Drive. Jumping castles, coffee, ice-cream and food carts, face and henna-painting, snags, musclebound stilt-walkers, K rock and others kept the punters laughing under brilliant sunshine.